B156 The Official Guide To BIONICLE is a BIONICLE book released in 2003. It details BIONICLE from 2001-2003, and so contains everything from the Toa Mata and Matoran to the Rahkshi and the Bohrok-Kal. 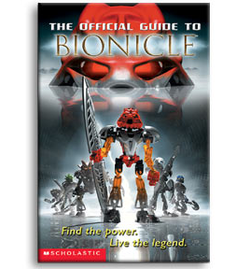 The Official Guide To BIONICLE was published by Scholastic. Facts about "B156 The Official Guide To BIONICLE"